• Learn more about the health of Diamond Lake and its watershed through research. • Educate neighbors and government representatives about issues affecting Diamond Lake. • Deliver engaging educational programming on water quality, natural habitat, and environmental preservation for children and adults. • Provide stewardship for the environmental well-being of Diamond Lake area residents of all species. • Centralize leadership for working with local and state government on all matters that concern the Diamond Lake watershed. 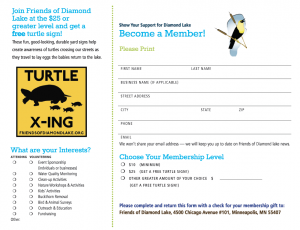 Friends of Diamond Lake is a nonprofit, proactive, citizen-led organization dedicated to restoring, protecting and improving the natural resources of Diamond Lake and its watershed. Founded by a group of neighbors in early 2008, it is led by residents from the neighborhoods in the Diamond Lake area in South Minneapolis. includes major portions of the HPDL, Tangletown, and Windom neighborhoods in Minneapolis.